For any number of reasons, shackle bolts often come up missing. This is not only a hassle and safety concern, but also an unwanted expense. Well, you can reduce the expense by buying just shackle bolts as opposed to entirely new shackles. 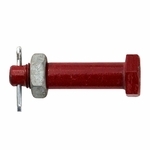 These bolt assemblies ship with a hex nut and cotter key, and are made by Crosby to fit their G-2130 and G-2150 shackles. Please note the nominal size of the shackle and the actual pin diameter are not the same thing, so double check your measurements below. Made from alloy steel. Safety factor of 6:1. NOT GUARANTEED TO FIT OR PERFORM WITH OTHER SHACKLE BRANDS.